Rec-Rac, the simple bike rack that attaches to a pickup truck's bed rail, will debut at Interbike its new racks that fit the newer Toyota and Nissan pick-up trucks with built-in tie-down rails. The Rec-Rac simply attaches to a truck's bed rail  no holes to drill, or front wheel to be removed. The bike is then secured to the rack via two soft rubber yokes and two rubber support straps. It's that easy. And to remove the Rec-Rac it's just a matter of loosening the clamp's heavy-duty clamping bolts and detaching the rack from the bed rail. 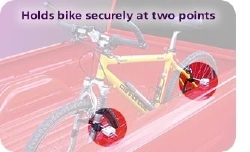 Using the Rec-Rac saves 90% of a truck's bed space for hauling extra cargo and gear when transporting a bicycle. The Rec-Rac's two independent non-maring, aluminum or stainless-steel clamps can be secured anywhere along a truck's bed rail so the rack can transport road bikes, mountain bikes, recumbents, even tandems (if you have an eight-foot bed). At Interbike, in addition to the new racks, Rec-Rac is offering free shipping to the continental U.S. with a minimum order. Rec-Rac's booth number is 2459. "I invite all of the dealers attending Interbike to stop by the Rec-Rac booth and see how simple and easy the Rec-Rac is to use," says Brent Price, President of Rec-Rac. "The Rec-Rac lets you transport bikes in a pickup truck without taking up all of the bed space." Dealers are also urged to place their orders before the price increase for stainless steel and aluminum takes effect. Will not mar bike or truck. Saves almost 90% of bed space. For further information contact Rec-Rac at 1-800-867-7764 or log onto the Internet at www.recrac.com.